The Lone Wolf Assault II Hang On Tree Stand is one of the lightest products in its class, which means that you will be able to benefit from enhanced portability and take it with you whenever you feel like trying out a different vantage point. It’s durable and versatile, and it has been found to be easy to set up, which should be an advantage in itself. Sure, it’s not the most affordable model ever to have been invented, but you have to make some trade-offs if you want to remain comfortable throughout a hunting day and rest assured that you’re safe while sitting on a tree. Let’s look at some of the features that make this product stand out from the crowd and that should convince you to at least consider it. Believe it or not, this tree stand weighs in at just eleven pounds, so its weight is almost incredible. You will be able to maneuver it with ease, even if you don’t like lifting overly heavy things. You’ll also be able to carry it conveniently once you attach it to your hunting backpack. Despite being so light, it doesn’t come in a small size, which means that you will have some decent room to stretch your legs once you become tired of sitting in the same position, for example. It also has a rather decent weight capacity, but we’ll touch upon that in a section below. Unlike some of the other products that we have stumbled upon while doing our research, this particular one is made out of cast aluminum. This is what makes it so lightweight. Unlike its steel counterparts, you won’t have to feel like you’re carrying a real burden when going from tree to tree. The material is responsible for the weight reduction of the model and is a great alternative to iron or steel. Something else you might want to know in relation to this product is that its weight capacity is 350 pounds. 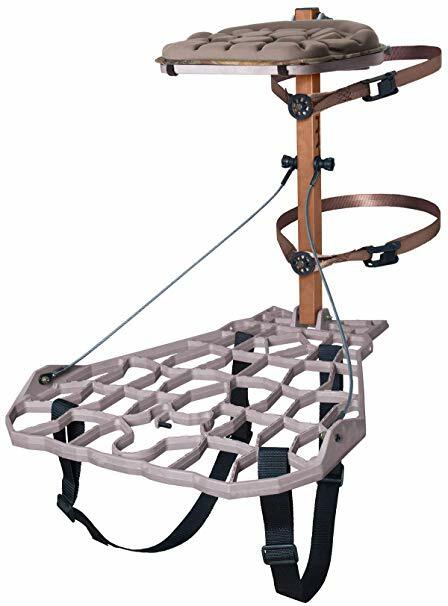 So if you are a mobile hunter whose physical attributes would make him or her feel a tad more comfortable knowing that they’re sitting in a good capacity tree stand, this one is definitely worthy of your consideration. The hang-on stand is the perfect alternative for those looking for the lightest setup and for a compact design that enables them to squeeze the stand into all sorts of tight places. One area where the Lone Wolf Assault II Hang On Tree Stand definitely doesn’t disappoint its owners is its ability to keep the hunter feeling comfortable for as long as possible. The platform measures 26 by 19.5 inches, which means that you have more than enough room to move around. Besides, you’ll be able to stretch your legs once you have been in the same body position for quite some time. The seat size is 14 by 12 inches while the height is 21 inches. The product comes accompanied with a somewhat thin cushion and you can get a thicker one as an upgrade. This is the point that some hunters have expressed in their reviews because they feel like the cushion should have been better given the cost of the product on the whole. 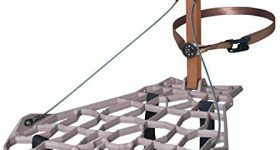 There are two things that should give you the reassurance you might require when it comes to safety, and every hunter should be concerned with this aspect when they are in the market for a brand new tree stand. One of them is that this product is equipped with rugged straps that you will use to get it set up. The other aspect is that this unit boasts a 6-point Fall Arrest System, which is pretty impressive given the competition in this sense. This unit can fit trees that have a maximum diameter of 22 inches. Sure, that might not make it extremely versatile, but you can get the most out of it by selecting the right places to install it. It is also shipped with a bow holder that can accommodate the majority of parallel limb bows out there. With this light stand and a light bow, you can enjoy your hunting adventures precisely as you should.